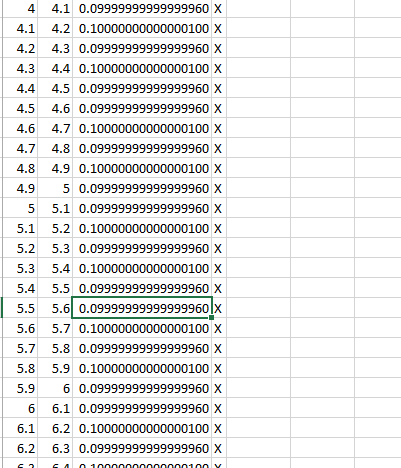 Everyone works with floating point numbers daily. If you go at a supermarket, the prices are like this: 11 eur 29 cents, 23 eur 35 cents and etc. As a C# developer and a blogger, I knew that there is some kind of a problem with the floating points and that the accuracy, but I did not realize how big it was. I thought that it only happens on some floating point numbers or similar. The truth is unfortunately not a pleasant one – it happens a lot in plenty of calculation with floating points. E.g., if you sum 0,10 with any number above 3, you would definitely not get number + 0,10. E.g. 10,1-10 is not 0,1! And that’s enough to say that the calculations are wrong. Actually, this is not only a bug in Excel, that’s a well-known bug in every computer language, due to the logic of the floating point numbers. In integer representation, every number is represented like the sum of the powers of 2. E.g., the number 43 is represented as 1+2+8+32. Or (2^0+2^1+2^3+2^5). Not more and not less than exactly 43. What happens, when we want to present decimal numbers? The idea, behind the floating point numbers, is that a floating point numbers are represented like this: 1/2 + 1/4 + 1/8 etc. Thus, the number 0.875 is easily represented as 1/2+1/4+1/8. Or 1/2^1+1/2^2+1/2^3. Quick and simple. And nice. With other words, for every number, between 4 and plus infinity, with a step of 0.1 Excel (and all the computer languages using doubles) makes an error in a simple calculation.
' 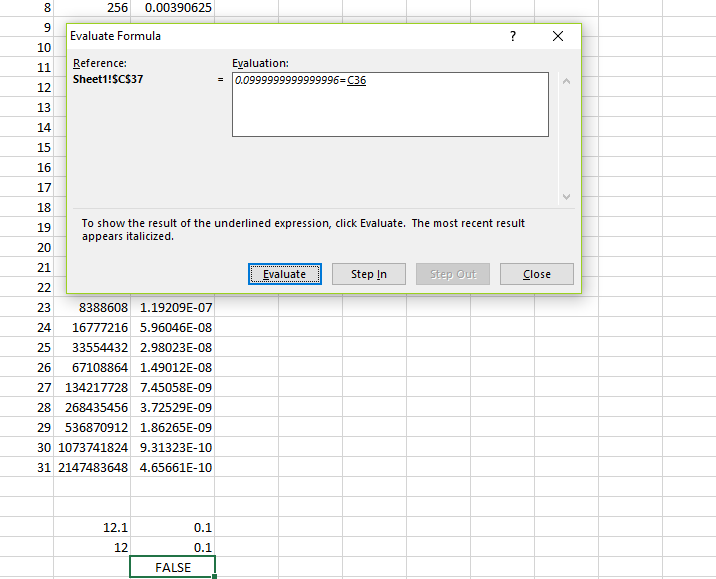 Purpose: Model to see how excel calculates floating point numbers. That’s true, decimals are not exact. And should not be compared. It works quite ok, rounding the numbers to what you see. In C#, we have the decimal variable, which is created exactly to cope up with this problem. And in any other language, we have a work around this. But still, before you see it, you never realize how big this problem is. 🙂 Here is what Microsoft says about the floating-point arithmetics.